Once you understand what happens to blood volume in relationship to the vascular container size.. It's a piece of cake! 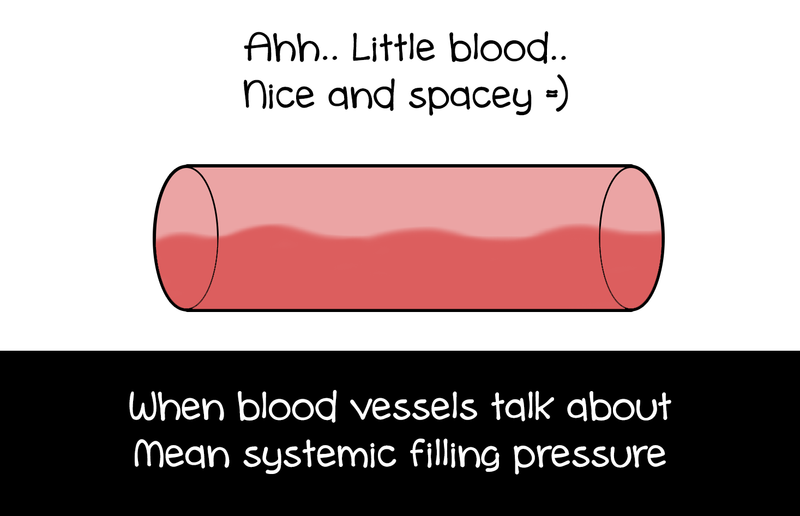 When blood volume increases relative to vascular container size, the mean systemic filling pressure increases. Examples of things that increase blood volume include transfusion and fluid retention by renal mechanisms (ADH, renin‑angiotensin, and aldosterone). 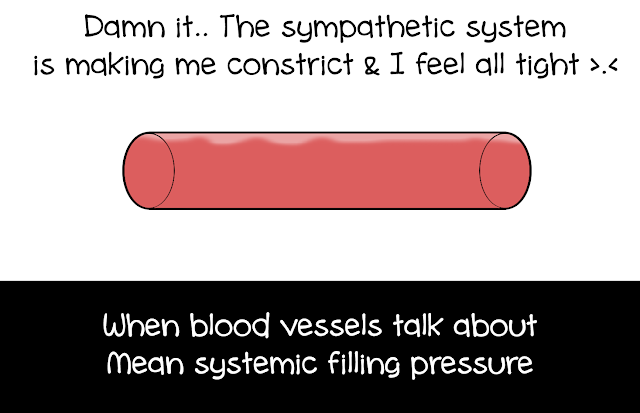 An increase in sympathetic tone decreases the vascular container size and increases mean systemic pressure. Circulating catecholamines act the same as an increase in sympathetic tone. Increased skeletal muscle tone and abdominal compression also decrease venous container size, increase the mean systemic filling pressure. The greater the MSFP the easier it is to push blood back into the heart. The major part of the blood volume is held within the venules and small veins so it is changes in venomotor tone which most affect MSFP. Sympathetic innervation producing venous constriction raises the tension in the walls of the venules and small veins and increases the pressure within the vasculature. Arteriolar vasoconstriction has an insignificant effect on total vascular compliance and so no direct effect on MSFP. This concept is graphically used in Cardiac Output and Venous Return curve. I hope the comics help you make sense of the definition! Question: What happens to MSFP during hemorrhage? Why do they MSFP decreases when vasoconstriction due to sympathetic tone decreases the vascular compartment size, increasing the MSFP? 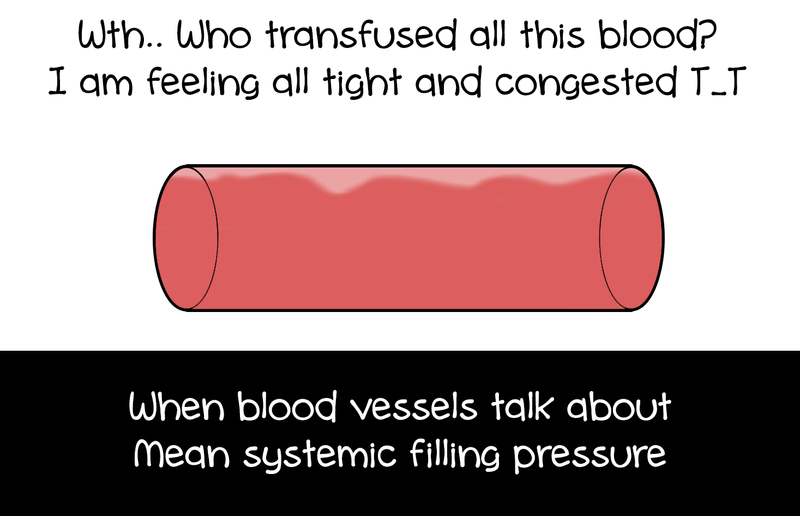 Explanation: Mean systemic filling pressure provides a measure of the degree to which vascular system is filled with blood. MSFP decreases because there is a blood loss. The decrease in blood volume and venous return decreases the baroreceptor firing and there is a reflex tachycardia and vasoconstriction. If this increase in sympathetic tone compensates for the blood loss, the MSFP will increase back to normal. It won't increase more than it should. 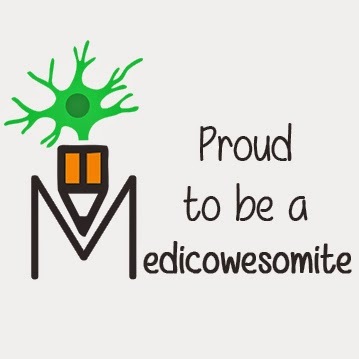 Most of the time, especially when there is severe hemorrhage, the reflex isn't enough to bring the MSFP back to normal. That's why, we say there is a decrease in MSFP. Cool fact: MSFP is "specially" used to measure haemodynamic changes during haemorrhage. Updated on 3/1/14: Question on hemorrhage. how is mean systemic pressure calculated? I don't know. By clamping the aorta in anaesthetised rats or something. 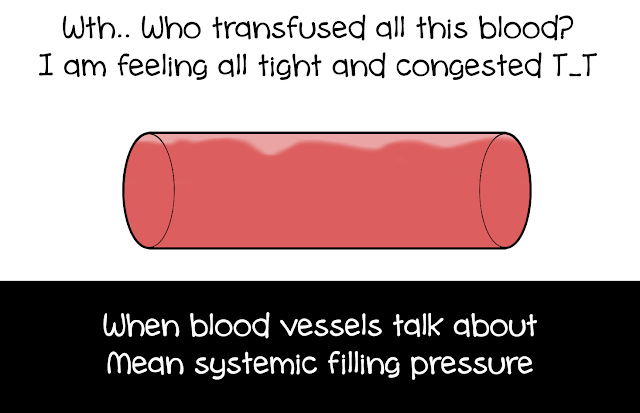 Can you explain the difference between mean circulatory filling pressure and mean systemic filling pressure? These two concepts have me completely confused. They seem to be very similar; I am missing the distinction. Thanks in advance! I think Mean Circulatory Filling Pressure (MCFP) is due to the elastic recoil of the blood vessels only and Mean Systemic Filling Pressure (MSFP) is due to both - elastic recoil and blood volume. A change in MCFP provides a uniquely useful index of a change in overall venous smooth muscle tone "if the blood volume is not concomitantly changed." MCFP represents the average integrated pressure throughout the circulatory system. It can be measured by stopping blood flow and allowing the pressures throughout the circulatory system to reach equilibrium. It may be thought of as a measure of the elastic recoil potential stored in the walls of the entire circulatory system (including the heart and pulmonary circulation). As such, it is a function of the volume of fluid within the system and the capacitance of the system. As more fluid enters the circulatory system (such as during transfusion), the MCFP increases because the elastic energy within the system increases. Mean systemic filling pressure (MSFP), though often confused with MCFP and often similar in value, is different. MSFP represents the pressure generated by elastic recoil in the systemic circulation during a no-flow state. MSFP can be affected by the distribution of flow and volume prior to stopping circulation. However, it did not make much sense to me and I am still not sure. Maybe you can read it and let us know? Mean arterial pressure is dependent on the cardiac output. So if CO = 0, MAP will be approximately zero too. Mean systemic filling pressure is independent of cardiac output. In fact, it's the pressure when the cardiac output is zero! Awww. Thank you so much! This was such a cute explanation!